IMPORTANT NOTE – While due care has been taken in copying across extracts from the Rules these extracts do not override the official copy of the World Council of Ju-Jitsu Organisations Sport Ju−jitsu & Grappling Tournament Rules. S1.1 Match Duration – All contests consist of 2 rounds of 2 minutes of continuous fighting. In the event of a 2-round tie, a third round of 2 minutes will be played to decide the winner. Should a tie still prevail, additional rounds of 30 seconds will be played until a winner is decided. S1.2 Calls – Competitors must be aware of 4 calls, namely “BEGIN”, “BREAK” “HOLDING” and “CONTINUE” given only by the referee. S1.3 Informal bow – Competitors must bow to each other before and after the match. Refusal to do so will constitute an immediate disqualification by the referee. S1.4 Start position – The contest shall begin with both competitors facing each other in a standing position, the referee facing towards the table with red to his or her right and white to his or her left. After making a standing bow, the contest will start after the referee’s call to “BEGIN”. S1.5 Scoring by the judges – will be tabulated using mechanical hand counters (clickers). Each hand counter must have attached a suitable size flag representing a competitor (red in the right hand and white in the left). S1.6 Match area – Competitors will compete within the match area and all techniques are to be executed from within that area. S1.7 At the end of each round – the referee will instruct the fighters to “BREAK” and return to the starting position, the referee will first confirm that all judges are ready, and then call “CALL” for a show of flags and the corner judges will raise the appropriate flag. In the event of a draw both flags must be raised. Competitors will be allowed a 30-second break (recorded by the timekeeper) between 2-minute rounds. S1.8 Each round will stand on its own merit – and hand counters will be cleared subject to article O3.4 (duties of the mat arbitrator). Penalty infractions however will be cumulative from each round. S2.1.1 In the event of a tie – a third round will be played to decide the winner. Should a tie still prevail, additional rounds will be repeated until a winner is decided. S2.1.2 A third round – is only played when there is a draw after the first 2 rounds i.e. if there is 1 win each or 2 draws. If there is a draw and a win in the contest, the winner of the contest will be the competitor who won a round. S2.1.3 In the event of an injury where a competitor cannot continue – refer to article S2.3, S2.4, S2.5 and S2.6 herein. S2.1.4 Disqualification – if a competitor is issued a disqualification at any time during the match (first round, second round, during overtime), this signifies a loss of the contest and the other competitor wins. Additionally, a determination is to be made as to the level of disqualification minor or major under article S16 (Disqualification). S2.2 Injury with bleeding or a wound – The round will be stopped and “time-out” called to allow the competitor to be attended to. If the bleeding cannot be controlled within 2 minutes the round will be called as herein article S2.3 or 2.4 herein. Any blood on the mat surface must be cleaned before play continues. S2.3 Injury not due to a foul – If a competitor sustains an injury that is not attributed to a foul, and cannot continue then the referee will call for a score from the judges and award the round accordingly. If the competitor is injured in the first round, then the second round will be awarded to the opponent. (Injured competitor will be subject to article S2.5 (Injured competitor returning). S2.3.1 Recovery time – At the discretion of the referee in consultation with the judges, a competitor may be allowed up to 2 minutes to recover from an injury following which the competitor must either continue or the round must be decided. S2.4.1 Excessive force and or disqualification – If it is ruled the incident was due to excessive force and/or the offending competitor be disqualified the match is to be awarded in accordance with article S2.1.4 (disqualification). a) Where a majority decision of the referee and judges agree it is reasonable to conclude the inability of a competitor to continue was a direct consequence of the type of foul, the match will be awarded to the injured competitor. b) Where a majority decision of the referee and judges do not agree as to a) the match will be awarded as provided under S2.3 (Injury not due to a foul). S2.5 Injured competitor returning – A competitor who wishes to return to competition after a decision has been awarded under article S2.3 or S2.4 will not be permitted to return until the Tournament directors are satisfied the competitor has received appropriate medical / first aid clearance to compete. S2.6 Injury causing unconsciousness – Where a competitor sustains a head injury causing unconsciousness (concussion), the competitor will not be allowed to continue or enter further contests throughout the Tournament unless he or she first obtains a medical clearance. S2.6.1 Where the offending competitor is disqualified because of the incident the matter must be referred by the Referee or Arbitrator to the Tournament directors for a decision on the level of disqualification major or minor (article S16 disqualification). S3.1 Light touch contact – Where contact is permitted this is the only level of acceptable force and applies to all forms of competition – refer to ‘rules of contact’ for each type of technique. S3.2.1 A technique does not contact – however in the opinion of the referee or a judge would have been excessive if the technique had made contact. S3.2.2 Regard for safety – A competitor attempts or performs a technique that in the opinion of the referee or a judge does not have sufficient due regard for the safety or welfare of the opponent. S3.2.3 Opponents movement – The onus is upon competitors to have sufficient skill and control in their technique and the movement of the receiving competitor will not reduce a call for excessive force. S3.2.4 Injury sustained – Should a competitor sustain an injury because of the level of force then the referee is required to call the judges together. S3.3 Potential Force – The scoring of a strike or kick is awarded by a judge on his or her assessment of the ‘potential force’ of the technique. This relates to the control within a technique as assessed by a judge in awarding a score, for example a controlled strike or kick delivered to a legal target area by a competitor without having fully extended the arm or leg. S4.1 Standing [15 seconds] – Once a competitor takes hold of his or her opponent in any ‘legal manner’ both competitors will have approximately 15 seconds to commence a ‘legal takedown’, after which time the referee shall call “BREAK”. S4.1.1 In the standing position both competitors may continue to score with legal strikes satisfying the requirements in article S8 (scoring - strikes and kicks). A competitor who is on the ground as the result of an ’illegal takedown’ cannot be scored on. S4.2 On the Ground [30 seconds] – Once a competitor has gone to the ground following a ‘legal technique’ the referee will call “HOLDING” and the timekeeper shall allow 30 seconds (see also article S6.3 takedowns) in which time either competitor may attempt to obtain a legal submission on the other. S4.2.1 Contestants will fight Ju-jitsu / Judo style of groundwork – and will be allowed to use locks, strangles, pinning techniques, and strikes, all subject to the criteria and limitations stipulated within articles S5 to S8 – scoring techniques. S4.2.2 While manoeuvring during the grapple competitors are permitted to be in a lying, sitting or kneeling position, may push with feet or hands, and may capture the opponent with their legs. Except as in article S4.2.4 herein, a competitor is not permitted to continue to attack while standing. S4.2.3 On the ground it is illegal – to kick, or go for the eyes, ears, nose, hair, the groin area, or strike to the head or back. S4.2.4 Coming to the feet – Once “HOLDING” has commenced should one or both competitors come to a standing position the holding will continue for the full-time period unless the holding is released by both competitors, or the referee calls “BREAK”. S4.2.5 Stalemated – The referee should stop the grappling if he or she thinks the competitors are stalemated or after a signal from a judge who may have seen an infraction. S4.3 If a contestant submits – or the referee calls “BREAK”, the fighters must release all holds immediately. S4.4 Nerve Pressure – the applying of pressure to nerve points within legal striking target areas plus the inside of thigh (not groin), whilst grappling is permitted when used to assist in manoeuvring an opponent however not to gain a submission. S4.5.1 Due care / Excessive force – Techniques are to be executed with due regard and care for the safety of the opponent. The use of excessive force in the application of a technique will be penalised, this may include where a competitor lands on top of his or her opponent in the execution of a takedown or throwing technique. S4.5.2 After Holding – A competitor who has come to their feet after the call of “HOLDING” is not allowed to lift his or her opponent off the mat. S5.1 Win by Competitor Submission – a competitor will win the current round where their opponent signals their submission to a legal technique. The observation of a referee that a competitor has submitted will have the support of all judges and cannot be challenged. S5.2.1 The submission technique was controlled and satisfied the rules of contact. S5.2.2 To allow the continuation of the submission technique may result in injury. The referee will call “Break” and then call “Judges on the submission CALL” the support of one judge plus the referee will result in a win of the current round. Where the referee stands alone on his or her call then the referee will instruct the judges to add five (5) points to the successful competitor. S5.3 Submission not successful – Two (2) points total may be awarded where a judge is satisfied that a competitor was controlled on the mat by a legal submission hold for a period of five (5) seconds albeit the submission was not achieved. Note a competitor would not receive 2 points if 5 points are awarded. S5.5 Standing submission – A legal submission technique may be applied in a standing position and the opponent may be manoeuvred to a ground position provided there is no attempt to throw the opponent with a lock or strangle applied. However, if the immobilisation technique is lost during a transition to the ground or the opponent escapes, then the competitors are to be stood-up. Transition to the ground must be with due regard and care for the safety of the opponent. S5.6 On the Ground submission – A legal submission technique may be applied in a grappling position on the ground provided the technique is applied within view of the referee. If through the movement of the competitors, the referee is not able to monitor the technique then he or she will call “BREAK” and may either call for a submission under article S5.2 (win by decision) or declare no submission points, although 2-points under article 5.3 (submission not successful) may still be awarded by judges. S5.7.1 Competitors must be aware that the use of excessive force in the application of a technique or throwing or attempting to throw an opponent with a technique applied will be penalised. S6.1.1 The technique was controlled and satisfied the rules of contact. S6.1.2 The competitor was thrown to the ground with control using a shoulder, hip or hand technique. S6.1.3 Commentary 1: the throwing competitor performs the throw in a standing or on one knee position, and both feet of the opponent are projected upward to a height above the rest of the body. – This includes a technique where both legs are scooped upward. Commentary 2: where the throw does not quite satisfy the above criteria as to the projection of both feet upward, then either five (5) four (4) or three (3) points may be awarded to the competitor. S6.2.1 The technique was controlled and satisfied the rules of contact. S6.2.2 The competitor was thrown to the ground with control using a foot or leg sweep, or by a sacrifice throw where the throwing competitor commits his or her own body to the ground in performing the technique. S6.2.3 Foot sweeps must be executed below mid-calf, using either the instep (top padded area of foot) or sole of the foot; otherwise may be interpreted as an illegal technique. S6.3.3 Immediate pinning or submission – The transition progressed immediately into a pinning technique; or was part of a controlled manoeuvre from a standing submission referring to article S5.5 (standing submission). S6.4.1 Due care / Excessive force – Techniques are to be executed with due regard and care for the safety of the opponent. The use of excessive force in the application of a technique will be penalised. S6.4.2 Land on top – Competitors are to avoid throwing techniques that cause them to land heavily on top of their opponent in the execution of the technique. S6.4.3 Care of head and neck – Techniques that cause a competitor to land on his or her head or neck are not permitted and will be assessed as excessive force. S7.1.1 The transition – to the mat was the result of a legal technique, satisfying the rules of contact. S7.1.2 Time – The referee signals that the pinning technique was controlled for five (5) seconds. d) A tate-shiho-gatame (longitudinal or straight four corner hold). S7.1.4 The objective – of grappling on the ground is achievement of a legal submission (refer article S4.2 on the ground), however a competitor may score with a pinning technique following a transition to the mat. Further pinning techniques however will not score. Commentary 1: The opportunity to score with a pinning technique occurs only when the technique is applied as a continuation of a throw or transition to the mat; or as part of a submission hold. S8.1.1 In addition to satisfying all the criteria of article S 8.2 herein – the high kick demonstrated both skill and balance in its delivery and control. S8.1.2 High kicks – contact to the head is not permitted and will be penalised. S8.2.1 The strike or kick was delivered above the waist to a legal target area and satisfied the rules of contact. S8.2.2 Potential Force required – The strike or kick was controlled and had the ‘potential force’ to have: knocked-down, knocked-out, or incapacitated, the opponent. S8.2.3 The technique – showed retraction of the hand/foot or a controlled stop of the hand/foot; combination strikes, or kicks will be considered on their merit. A flurry is to be considered a repetitive number of doubtful strikes and will NOT score. Note 2 - the tactical intent is that strikes are used to assist progression to a transition to the mat. S8.2.5 On the ground – Strikes are permitted only to the front of the body (chest and abdominal areas above the waist) after a legal transition to the ground and limited to a maximum of three (3) striking points during the holding 30 second period, and only when the competitor is in the uppermost position and kneeling on one or both knees. Note 2 - the tactical intent is that strikes are used to assist progression to a submission. a) it is LEGAL to target: areas only to the front of the body above the waist unless elsewhere excluded. b) it is ILLEGAL to target: the throat, neck, eyes, any area to the back of the body including back of the head, kidneys; and when on the ground the head. S8.4.1 Contact not required – Techniques are to be controlled and where permitted limited to ‘light touch contact’, as scoring is determined on ‘potential force’ a strike or kick is not required to make contact to be awarded a score. S8.4.2 Visible or evident sign of injury will result in penalisation. S9.1 A contestant must not set out to deliberately injure his or her opponent during the match, as this will result in point’s loss or disqualification. Contestants must not use techniques that would almost certainly end up with an injury. Any blind technique including blind techniques within the grapple. Any foot sweep at mid-calf or above or using other than the instep or sole of the foot. Any improperly applied throw or takedown considered dangerous to a competitor. Any throw or takedown applied with excessive force considered dangerous to a competitor. All choking techniques or blocking of the airway. Kicking once grappling has commenced on the ground. Striking to the head once on the ground. Attacking nerve or vital points other than as allowed by article S4.4 (nerve pressure). Locking techniques to any joint other than as defined by article S5.4.1 (joint technique). Any technique, standing or on the ground where a competitor has his or her arm around the neck, exception being a legal strangulation technique (article S5.4.2) or legal pinning technique (article S7.1.3); or the opponents head under his or her armpit and therefore the potential to lock or crank the neck. Lifting an opponent off the mat after coming to a standing position from a grapple. a) Any technique considered to be unsporting including: pulling hair, biting, scratching, and jumping on a downed competitor. b) Any technique applied or attempted by a competitor who is not within the match/contest area, exception being as provided by article O6.2.1 (competitor is out of bounds). a) Use of excessive force. b) Attacking an illegal target area. c) Using an illegal technique. d) Performing or attempting a technique while not within the match area unless permitted by article O6.2.1 (competitor is out of bounds). e) Running or stepping out of bounds to avoid fighting (fighting out does not apply), or Intentionally moving out of bounds. f) Falling on the floor to avoid attack (a competitor attempting a throw is exempt from penalty). g) Continuing after being ordered to BREAK or stop. h) Kicking or striking to the head after grappling has commenced on the ground. i) Negligent or reckless attacks (whether actual contact is ever made). k) Avoiding contest by continually retreating, not competing, or wasting time. l) Disrespect displayed to officials or opponents (includes expressed disappointment after a ‘call’ or decision. m) Not obeying an instruction of the referee. n) Abuse by a competitor or Team member towards any Official is grounds: for penalisation under Article S 12 (Voting on Penalisation) including disqualification for serious or repeat incidents; and or being directed to leave the Tournament. S11.1 The referee may without the signal of a judge, issue a caution to the competitors at any time during a match. Such caution will not be recorded by the table officials. S11.2 The referee is empowered to call a judges’ conference at any time. The majority vote of all judges and the referee will determine the penalty imposed. S12.1 Majority vote must be penalised – If majority of all judges or a judge and referee agree that a competitor is guilty of an offence, the violating competitor shall be penalised. S12.5 Third Offence any combination – A third offence for any combination of the rule infractions requires that the competitor be disqualified. S13.1 Majority vote must be penalised – If majority of all judges or a judge and referee agree that a competitor is guilty of excessive force, the violating competitor must be penalised. S13.4 No majority vote – If there is not a majority vote by the judges on excessive force, the referee may issue a caution on his or her own, without the consent of the judges. The referee shall advise the judges not to score the point. This will however not record as an official warning. S13.4.1 After a second caution by the referee, without a majority vote, a meeting with the judges shall be called for a clarification on excess force as outlined in article S 3 (force required to score). Refer also article O3.2 (Duties of the mat arbitrator). S14.1 Whenever a warning is issued the referee must be specific in their warning and within hearing of the judges and competitors. For example, “the next time you (identify the infringement) you’re going to (identify the penalty), do you understand?” e.g. “the next time you use excessive force you’re going to be disqualified, do you understand?” … The referee should wait for the competitor to acknowledge their official warning AND the recording of warning by the scorekeeper, before allowing the contest to continue. S15.1 Angry and uncontrolled violent displays of behaviour will not be tolerated. If a referee believes a competitor is guilty of such an infraction, he or she may call a judge’s conference. Following the conference, a majority vote of all judges will cause the offending competitor to be disqualified. Judges should not tolerate undisciplined displays of temper. a) Minor Disqualification – is for the existing contest only. b) Major Disqualification – is for the balance of the tournament or a designated period to be suggested by the majority decision of the mat referee and judges and submitted to a convened meeting of the Tournament directors for their ruling. S16.2 Twice disqualified – Whilst not restricting the ability to issue a major disqualification, a competitor who is twice disqualified for excessive force for which a minor disqualification is awarded shall have the level of disqualification reviewed by a convened meeting of the Tournament Directors. S17.1 A legal protest can only be lodged for a non-compliance of the rules and can only be introduced by the official designate of the protesting association or country. S17.2 Legal protests must be lodged with the mat arbitrator. S17.3 If the match is still in progress – the mat arbitrator will approach the timekeeper, who will immediately notify the referee. The referee will immediately call, “Time Out”. G1.1 There will be one referee – unless the Tournament Directors deem it appropriate to appoint two additional referees for one or more matches, who will be seated in chairs placed at opposing corners of the match area. G5.1 Prior to the tournament or a division within the tournament, the Tournament Directors may deem it appropriate to exclude the awarding of advantage points. G6.1 Illegal moves – The rules to apply as for Blue Belt, except where both competitors hold a BJJ grade above blue then the applicable rules will be those represented by the more junior of the two competitor’s grades. G9. 1. Match Duration – All contests consist of one round of six minutes of continuous fighting following which a decision will be awarded. G10.1 Refer SJJ Article 5 (The Competition Draw – Round Robin) – The same provisions as for Sport Ju-Jitsu shall apply to the extent of any difference. G17 Where there exists conflict between the rules herein for Sport Ju-Jitsu and the IBJJF Rules, the Sport Ju-Jitsu Rules will apply. G 18.1 Injury due to a foul – If a competitor is injured due to a majority called infraction (foul) and cannot continue the offending competitor cannot be awarded the win for that match. The win must go to the injured competitor. The medical or senior appointed qualified first-aid officer must make the decision for an injured competitor not to continue fighting and the competitor cannot recommence competing in the Tournament until he or she is given medical / first aid approval. The referee should be informed of this. G18.1.1 Where it is ruled that a competitor has ‘intentionally’ injured their opponent this may invoke a ‘major disqualification’ as defined in article S 16 (Disqualification). G18.2 Injury not due to a foul – If a competitor sustains an injury, which is not attributed to a foul, and cannot continue then the referee will award the round accordingly. G18.3 At the discretion of the referee(s), a competitor may be allowed up to 2 minutes to recover from an injury following which the competitor must either continue or the round must be decided. G18.4 Injury with bleeding or a wound – The match will be stopped and “time-out” called to allow the competitor to be attended to. If the bleeding cannot be controlled within 2 minutes the round will be called as herein article G18.1 or G18.2. Any blood on the mat surface must be cleaned before play continues. G18.5 Loss of consciousness – The competitor shall be declared to have lost the match upon losing consciousness due to a legal hold applied by the opponent or due to an accident not stemming from an illegal maneuver by the opponent. G18.6 Injury causing unconsciousness – Where a competitor sustains a head injury causing unconsciousness (concussion), the competitor will not be allowed to continue or enter further contests throughout the Tournament unless he or she first obtains a medical clearance. G18.6.1 Where the offending competitor is disqualified because of the incident the matter must be referred by the Referee or Arbitrator to the Tournament directors for a decision on the level of disqualification major or minor (article S16 disqualification). Tournament directors may after the official weigh-in; agree to change the ladies weight divisions and the number of divisions, to more appropriately group competitors who register to compete. 3.3.3 Competing in a higher division – In the individual events men’s and ladies, competitors may only compete in their own weight division: Provided the Tournament directors may agree that competitors be permitted to compete in a higher division where an association has more than two competitors in the one weight division. Weight divisions – Each association may register up to 6 competitors aged 40 years and over to compete in the master’s event. The Tournament directors will after the official weigh-in, agree on two or more weight divisions in both the men’s and ladies masters event determined on the weights and the number of competitors who register to compete. 3.5.1 Weight divisions – each country team will comprise the weight divisions as set-down in article 3.2 herein: Provided if there are insufficient competitors to compete in Division 1 and or Division 7 then these divisions may need to be excluded from the Teams. 3.5.2 Team Selection – The country team for this event both men’s and ladies, will be decided following the completion of the individual events, at which time the seven (7) competitors (one from each weight division subject to article 3.5.1, who performed best in the individuals will be invited to enter the team event competing for the country championship. If two or more competitors qualify within a weight division, in the first instance the member association delegate(s) shall agree who to select, however if no agreement is reached then the appointed country representative with the Tournament directors shall decide. 3.5.3 Injury substitute – In the event of an injury to a championship team member another competitor in the same weight division (or lower) may substitute onto the championship team. Once a substitution has been made, the injured competitor cannot return the team competition, but may still participate in other events. 3.5.4 In-team substitute – If a weight division is filled by another team member that person would compete twice, both in their own weight division and in the higher substituted weight division. The only exception is the lowest division, which has no substitution in which case his or her rounds are forfeited throughout the balance of the tournament. a) A country that has not less than four competitors for their championship team, may accept a person(s) from another competing country to make up a full team. b) Competitors from different countries may combine to form a men’s or ladies team that will be appropriately designated based on the area of the World from where the competitors come. These competitors must then compete in all team events and stay with that team throughout the team competition. Tournament Directors may after the official weigh-in; agree to change the divisions and the number of divisions to more appropriately group competitors who register to compete. 3.6.3 Competing in a higher division – In the individual grappling events men’s and ladies, competitors may only compete in their own weight division: Provided the Tournament directors may agree that competitors be permitted to compete in a higher division where an association has more than two competitors in the one weight division. 3.7.1 Participation – Each association may enter one demonstration team and while there is no limit on the number of persons within the team, there will only be 6 medals available within each place: first, second and third: Provided that two or more associations from the same country may join to make-up a demonstration team. Weight divisions do not apply and a team may include junior competitors. 3.7.2 Time limits – The demonstration shall be performed in two parts one following the other, both of not less than five-minute duration provided the total time does not exceed 12-minutes with the time commencing once the team leader acknowledges the judges. a) Part 1 Technical maximum score 15 points – shall demonstrate technical aspects of ju-jitsu within the chosen style and will be assessed on variety of technique and technical merit. b) Part 2 Entertainment maximum score 10 points – shall provide an entertaining demonstration of ju-jitsu techniques and will be assessed on entertainment value for spectators. The association may choose to play appropriate music during the Part 2 demonstration. 3.7.3 Judges score and time penalties – Five judges shall be appointed from different countries with the lowest score and highest score in each section (technical and entertainment) being discounted and the remaining scores, of the three judges, accumulated. Two-points shall then be deleted for each minute (or part thereof) under five (5) minutes on both Part 1 and Part 2; plus two-points for each minute (or part thereof) over the total of twelve (12) minutes. Ju-jitsu evolved in Japan at a time of feudalism and as Japan moved to the Meiji period (1867-1912) with the abolition of the shogunal system and restoration of power to the emperor, this brought an end to the system of feudal domains, Daimyō the powerful warlords of feudal Japan, and the samurai class as a whole. To-day ju-jitsu tournament and the rules of competition are obviously very different, and competitors who compete in WCJJO sport ju-jitsu tournaments adhere to strict rules of safety. This is not to suggest that the techniques demonstrated in competition reflect the total of ju-jitsu, and one should differentiate between ju-jitsu and sport ju-jitsu. Over time, as a true student of a martial art, one comes to appreciate the depth and breadth of knowledge and competency required to become a master within that art. This is very different to the cross training and learning outcomes from practicing a variety of martial arts as promoted within mixed martial art tournaments. You will observe in mixed martial art tournaments that different competitors have varied skill in: throwing their opponent; grappling with their opponent; immobilisation of a joint; or successful application of strangulation; while others may rely more upon striking and kicking their opponent … but wait WCJJO sport ju-jitsu includes all of these, without the need to cross train. So what’s the difference? The obvious difference is in WCJJO sport ju-jitsu there is no cage, and a competitor is free at any time to step into a safe area surrounding the mat … Next - the level of allowed contact under WCJJO rules is ‘touch contact’ with strict rules on what might be deemed as excessive force … one might suggest that WCJJO sport ju-jitsu is MMA without the lust for blood. Compulsory - The use of safety equipment i.e. 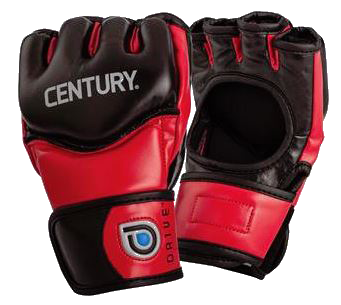 approved sparring gloves or mitts, instep protectors, mouth guard, and a groin protector (females optional) are mandatory except for Demonstration and Grappling Ju-jitsu Events. 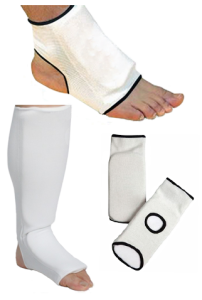 Sparring Instep Protectors – (compulsory) shall consist of soft foam padding covering the instep area of the foot ... see picture. Shin guards – (optional) that are part of or compliment the Instep Protector and are of the same material. 1.2 Persons of an equivalent grade standard from other related martial arts that include training and possess competency in each of the areas covered by these rules and belong to a member or provisional member association of the WCJJO, in good standing of their respective association, may be accepted to participate in the competitions of the WCJJO. 1.3 Citizenship and positive proof of domicile will dictate the country the fighter represents subject to article 3.5.5 (mixed country team). Documents such as a passport and driver’s license may be requested. 1.4 Knowledge of risks – Competitors shall attest to their knowledge of the risks involved in participating in a tournament by completing a Competition Participation Agreement Waiver and Indemnity (refer Appendix D). Competitors must be not less than 18 years of age and persons who are less than the legal adult age either within their own country or the host country of the competition may only participate if their parent or legal guardian signs on their behalf. 1.5 Health and fitness of competitors – participating in competition is to be attested to by the respective Association. 1.6 Required dress – Competitors must present themselves suitably attired in a clean, traditional uniform (Gi) with a formal rank belt. Tournament Gi’s that are a traditional type wrap over with minimum three quarter (¾) length sleeves are the only ones that the competitor will be allowed to compete in. This rule will be enforced in all tournaments. Accept for female competitors, T-shirts are not to be worn under the Gi unless an acceptable reason can be provided. 1.7 Personal items – jewellery must be removed, and long finger or toe nails must be cut or covered. The wearing of eyeglasses during competition will not be allowed however contact lenses are acceptable. 1.8 Coloured Belts – For purposes of identification during a match one competitor will wear a red belt and the other competitor a white belt, coloured flags or pennants attached to the belt are not permitted. Personal grade belts will not to be worn while competing. Competitors must present themselves suitably attired in a clean, traditional uniform (Gi) with a formal rank belt. Tournament Gi’s that are a traditional type wrap over with minimum three quarter (¾) length sleeves are the only ones that the competitor will be allowed to compete in. This rule will be enforced in all tournaments. Accept for female competitors, T-shirts are not to be worn under the Gi unless an acceptable reason can be provided.